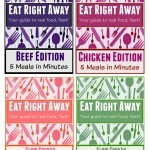 Eat Right Away ~ Introducing $2.00 Packets Built to Bless Your Family Dinner! This idea has been a long time in the making! I’m very excited to introduce our latest project. 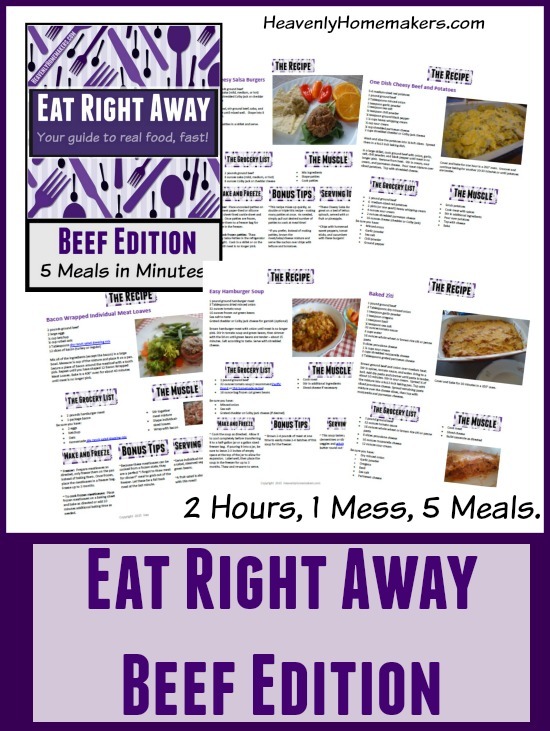 It’s a collection of downloadable make-ahead recipe and instruction packets called Eat Right Away: Your Guide to Real Food Fast! 5 individual meal grocery lists, plus 1 big grocery list to aid you in making all five meals in one sitting (though you’ll actually be standing, not sitting, my apologies). Freezer safe instructions for each recipe, plus guidance on thawing, reheating, and serving each meal with little effort. Each packet is only $2.00, and we’ve made it easy by packaging all four packets together into one $8.00 collection! Yep! That’s it. We want to get them into all of your hands to help you save time and money in your real food kitchen. Each recipe is family friendly, easy to prepare, contains simple, real food ingredients, and can be made ahead and frozen so that you can Eat Right Away! Bonus! So far, the ten recipes in these two packets can be easily adapted to be gluten free. The only ingredient which is not naturally gluten free in these recipes is pasta. Sub the wheat pasta for rice or corn pasta and voila! 10 gluten free recipes that you can Eat Right Away! Make all five meals in about 2 hours time. Be rewarded with five delicious meals to pull out and serve with little additional effort! 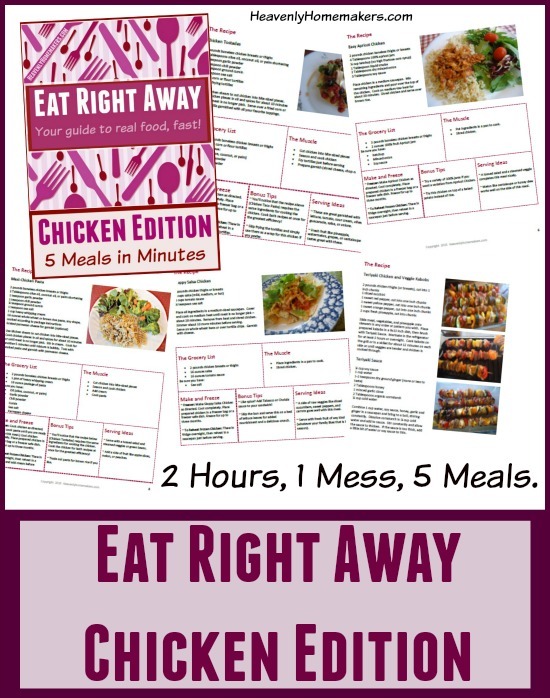 Make all five meals in about less than 2 hours time. Be rewarded with five delicious meals to pull out and serve with little additional effort! Just like the chicken recipes, you can make all five beef recipes in about one hour. Put them in the freezer or fridge. Pull them out and throw them into the crock pot. Grab these four packets and get started with putting together these 10 great meals so that you can Eat Right Away! I’m looking forward to all of these to be perfectly honest. But if I had to choose I’d vote for the meatless edition next because when you’re on a budget, meat takes a huge hunk of the money. 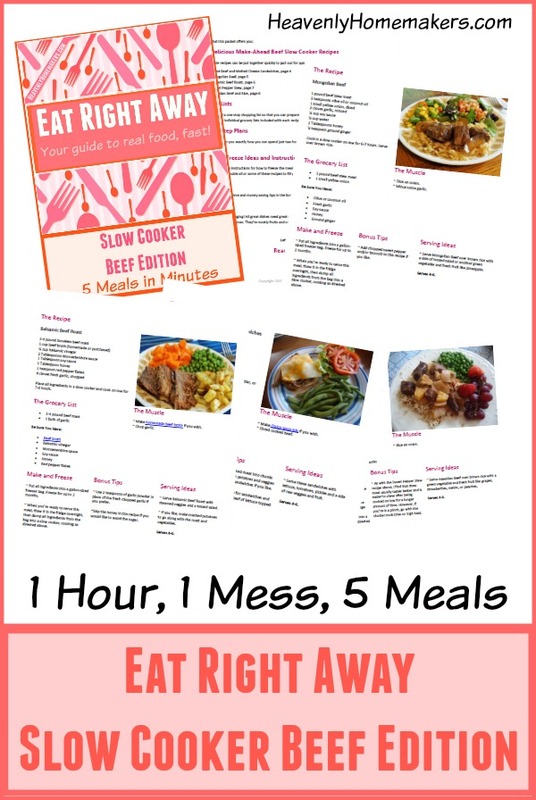 Slow cooker editions with summer coming up!! Please!! It’s going to be too hot to run the oven. Meatless and slow cooker please :) Have a wonderful day Laura! I would enjoy the crock pot packet next. It’s getting hot and we don’t use the oven during the summer. Ok, so I have a tear in my eye (not kidding). These are such an appreciated resource! A HUGE thanks from those of us who struggle with brilliance in the kitchen. Laura, thank you for sharing your gifts to bless so many ladies and their families…..Will be purchasing these as soon as my household budget is replenished. ???? These sound like a terrific resource; what a great idea! Thank you so much for putting these together! 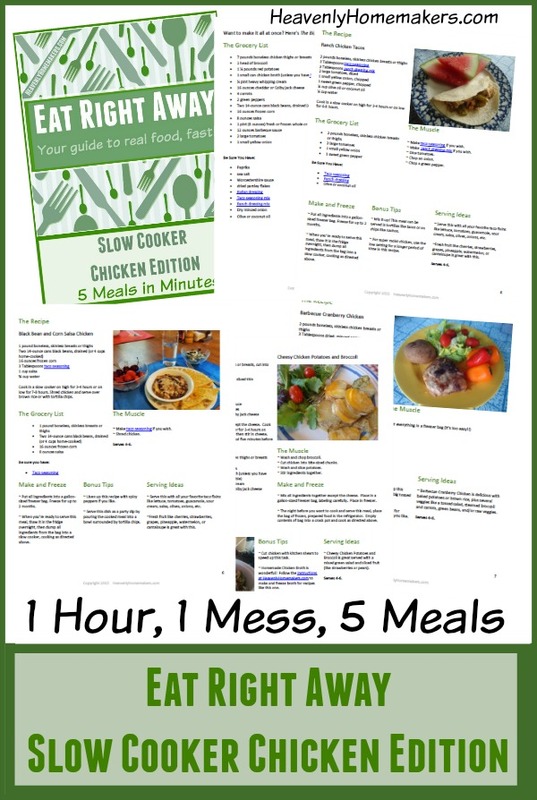 All the packets sound wonderful, but I’d be especially interested in some new, different, tasty, healthful slow cooker recipes now that the weather has gotten hot where I live. These look fabulous! I think the meatless or lunchbox editions would be awesome. We homeschool, but it’s still nice to quickly pull something out for the kids’ lunch. My apologies if this was posted and I missed it. Is this an “E” packet or do I get it mailed to me? assume it’s something I print from home? It is an e-packet. I feel silly that I never made that clear! Thank you for pointing it out. I’ll edit the post to let people know! I’m with Stacy. We homeschool too but I’m often at a loss for lunch ideas. The lunch box edition would be great. Whole food lunch ideas that don’t always use bread would be really nice!! Do you think you’ll bundle these when they’re all ready? (Like the e-book overload.) I’m wondering if I should wait to buy since I’ll want them all. Thanks! I probably will bundle these eventually just to make it easier on everyone in the long run. But since they are already at a low price, I really doubt I will make the bundle discounted (except for the rare sale I might run). Laura you are AWESOME! These are amazing resources! I definitely could use some help in the lunch department. Both hot and cold since my hubby doesn’t have a way for hot lunch at this time. Thank you again for these recipe packs! Yummy! Laura, thank you for helping make things easier for those of us who struggle with what to make. My vote is crockpot or meatless for the next one. Can the teriyaki chicken be made with a different sauce? My husband really doesn’t care for anything teriyaki but the rest of us like it. I usually start with a whole frozen chicken. Would these recipes need adjusting? Any tips or thoughts? Ideally I would love to start the “session” the day before by roasting a few chickens and setting the meat aside for part 2. I’m looking forward to all of them! So hurry!!! LOL –We will patiently wait. Have you posted the Meatless edition, Breakfast edition, and Lunchbox edition? I can’t find them on your store? 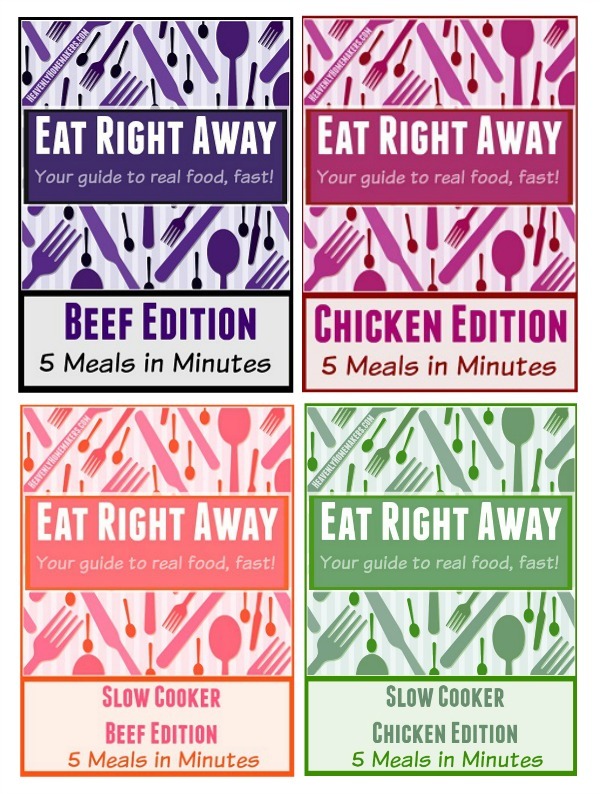 HI Laura, I was interested in purchasing all the Eat Right Away ebooks but I only have in my cart both the chicken and beef editions and slow cooker editions…. I was very interested in the lunchbox one and meatless and soup ones…. Are those available for purchase? Also was interested in the breakfast one….. The whole collection if possible. Not yet, those are still in the works!